Globe sundial made from stainless steel. Light segment display. Central European Time or any other standard time and the Sun's position over the world. Securing material, tools and a manual are supplied. A globe sundial with a time ring to display any zone time (i.e. Central Europe CET/CEST) and the noon position of the Sun. The time ring, which was specifically developed for the MONDO, contains light conductors which catch the Sun and illuminate light segments on the surface. The light segments light up in sequence with the apparent movement of the Sun across the globe and display the time and the Sun's position. In the eternal play of light and shade, you can track day and night, sunrise and sunset, polar day and polar night on the globe sundial. Adjusted for the geographic coordinates of your location, the globe is always lit up in the same way as the Sun lights the Earth. Globe made from a sanded stainless steel casts. Manufactured in a lost wax melting process, the wax model and the ceramic mould are each used for only one casting and are produced from scratch for each new globe. Careful artisinal crafting and a wealth of experience is required for this casting process, which is steeped in tradition. 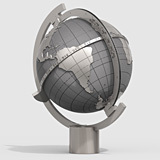 The globe (16cm in diameter) and all other parts are manufactured from stainless steel. The optical element integrated in the time scale ring is made of weatherproof acrylic glass. The sundial can be used outside all year round. The MONDO can be mounted on an adjustable base on an appropriate pedestal. Securing material, tools and a manual are supplied. 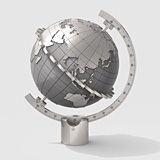 For all globe sundials, a stand made from stainless steel Ø50mm or Ø32mm or made from granite nero assoluto (85x85mm, height 1m) is available. Installation on a solid base or earth ground. Securing material, tools and a manual are supplied. The MONDO's base or the stand's base cover can be engraved with a message of congratulations or a motto on request. HELIOS Sundials for patio, garden and public spaces.